Games age so quickly. Jordan Mechner’s The Last Express ($4.99) was first released in 1997. That’s 15 years ago: time enough for pop to become “classic rock", and more than long enough for a television show to have developed an eternally loyal fanbase (Babylon Five ran 1994-8) or have been forgotten utterly (Lost ran 2004-2010). In the worlds of art and literature, 15 years is the blink of an eye. But videogames age faster than dogs. I think only the fashion industry devours itself on a more regular basis. Here, 15 years is a bloody eternity. So it was a relief to see just how gracefully The Last Express has aged, just how natural it feels on mobile, and that Dot Emu delivered such a masterful port (on a level with their port of Another World ($3.99). The Last Express plays like it was designed for mobile, albeit in a “headphones strongly recommended" way. That’s one of the game’s weaknesses: it is driven by it’s audio and categorically inaccessible to the deaf. There isn’t even an option to subtitle every conversation (dialogue in languages other than English are subtitled, just as in the original US release). But where are my manners? Some of you may not be familiar with The Last Express in any form. 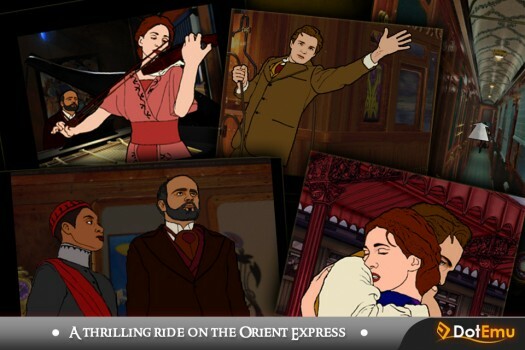 The entire game is set in a world tipping inexorably into war (1914, after the Assassination of Archduke Ferdinand), and on the most famous train in history: the Orient Express. 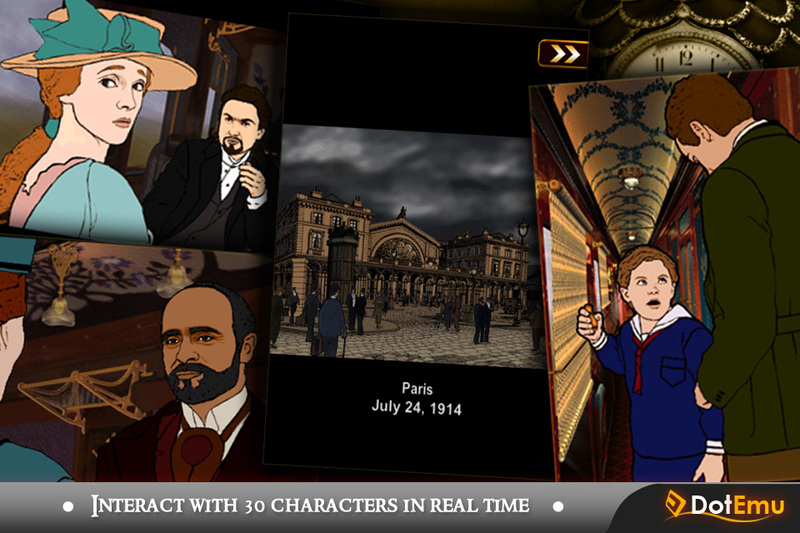 The game takes place in real time over the course of a single run from Paris to Istanbul, and has a plot worthy of a mystery novel or noir film: indeed, it seems certain that Murder on the Orient Express and The Maltese Falcon were among Mechner’s influences. Without giving away anything past the game’s intro, I can tell you that the protagonist, Robert Cath, is on the run and had made plans to meet his friend Tyler Whitney on the Orient Express, only to find when he gets there that his friend has been murdered. Once you figure out how to dispose of a body on a moving train, all that remains is for Cath to figure out who murdered his friend, who stole valuable items in Whitney’s possession, and just what game is being played by the cast of generally suspicious characters he is on the train with. The Last Express is an adventure game, broadly in the same vein as the old Lucasarts and Sierra games, but with two crucial differences. The perspective is first, rather than third, person, adding to the sense of claustrophobia as the game takes place entirely within the train’s limited confines, and, much more crucially, everything happens in real time, so people move about the train, have conversations, etc. regardless of whether you’re there or not. Wanting to hear and see things you missed before gives The Last Express somewhat greater replay value than other adventure games. Replay also exposes how confined the game is: a thing that some have been very critical of, but that seems to me to be simply a functional part of its design. The real-time model gets fudged a little in certain ways, but never feels forced. If anything about the feel of the game is odd, it’s Cath’s ghost-like presence. The man must have a knack for remaining unnoticed, as people continue their conversations in his presence as if he weren’t there. The game makes good use of thin walls and doors to allow you to overhear secrets, but at other times you can literally stand peering down at people as they gossip about you and they don’t react to your presence. Similarly, while the conductors will prevent you from going into someone else’s stateroom if they see you trying to do so, they are content to let Cath linger by someone’s door waiting for an opportunity to enter unseen, and they never ask questions when you mysteriously emerge from another traveler’s stateroom. Pair this with the way you move by shifting position or view (like Myst or any old-school dungeon crawler) and the result can be eerie, occasionally even disorienting. Once you get used to these quirks, the game’s rich visual and auditory landscape rolls over you, and it is easy to get lost in this game. You may find yourself reading all of the articles on a newspaper’s front page (the entire front page is legible, and most of the stories are completely irrelevant to your predicament) or lingering at your table in the dining room as other people arrive and then leave again. The plot will catch up to you, however, and you may find that you are doomed because of something you did or didn’t do an hour ago. No problem! When Cath meets an ill fate, the game simply rewinds (shown on a jeweled clock and in terms of the train’s progress on it’s route) back to the last playable point. This means you can read that paper and then rewind back to before you read it, if you want to, or you may enjoy the act of skimming another character’s private diary while they’re away, looking for clues while hurrying to avoid being caught. Part of how The Last Express passes the test of time so easily is because of it’s sure-footed sense of style. The combination of carefully-drawn railcars and rotoscoped characters create a distinctive period feel. The bits with full-motion rotoscoping are great, and the stop-motion (almost La Jetee-like) rotoscoped images work well enough. There’s a lesson here that should be obvious: good design uses technology, bad design gets jerked around by the “latest thing." 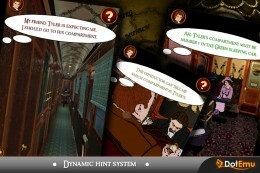 Dot Emu deserves a lot of credit as well: portrait mode suits the narrow confines of the train, and the option (default-on) icons on hotspots does a lot to keep this incarnation of The Last Express focused on story and suspense, rather than turning into a game of hunt-the-pixel. There’s even a progressive help feature to ease the transition. There was an ill-timed incompatibility issue with the iPhone 5, but that’s been fixed, so the less said of that the better. The Last Express does show a few signs of it’s age and it strictly requires audio, but it plays really well on iOS and its just as enjoyable as it was (and just as novel and unconventional as it was) back in the days of CD-ROM drives and the legalization of divorce in Ireland. The Last Express is a game I want my toddler to play in about a decade, and I have renewed hope that he’ll get the chance.